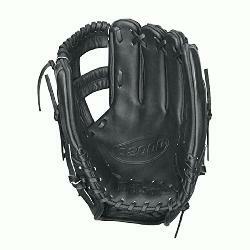 Wilson A2000 Baseball Glove EL3 Game Model 11.75 inch. 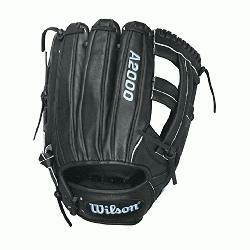 The Wilson A2000 puts unbeatable craftsmanship in the palm of your hand. Wilson spent countless hours working with MLB players to further refine the glove that has outperformed and outlasted all others for over 55 years. This line is expertly constructed with world famous Pro Stock Leather to provide durable performance game after game. The result – the perfect glove for hardworking players everywhere. The A2000 EL3 GM was developed by Master Craftsman Aso-San for third baseman Evan Longoria. The D-shaped deep pocket in this Game Model Glove is perfect for the hot corner. Designed with the classic look Evan prefers, the Wilson A2000 EL3 GM features black leather and laces and a cross web. Experience a glove made with unbeatable performance that was designed for the pros and now for you. 11.75 Inch Pattern. Colorway Black Carolina Blue. Cross Web. Dri-Lex Wrist Lining - Ultra-Breathable, Moisture Wicking Material. Ideal for Infield. Pro Stock Leather - Long-Lasting Structure, Great Break-In. Pro Stock Patterns. Rolled Dual Welting - Allows Glove to Retain Shape Better Over Time.